The less common variant of two arms raised at the same time. To some Westerners (Italians and Spaniards are notable exceptions) it may seem as if the maneki-neko is waving rather than beckoning. This is due to the difference in gestures and body language recognized by some Westerners and the Japanese. The Japanese beckoning gesture is made by holding up the hand, palm down, and repeatedly folding the fingers down and back, thus the cat's appearance. Some maneki-neko made specifically for some Western markets will have the cat's paw facing upwards, in a beckoning gesture that is more familiar to most Westerners. Maneki-neko can be found with either the right or left paw raised (and sometimes both). The significance of the right and left raised paw differs with time and place. A statue with the left paw raised is to get more customers, while the right paw raised is to get more money. Hence it is also said that the one with left paw is for business and the right is for home. Some maneki-neko feature battery- or solar-powered moving arms endlessly engaged in the beckoning gesture. Originally, the maneki-neko is in white. But over the years with the combination of Feng Shui, different color variations were born. The original white color is to get good luck and overall good fortune. Black is to ward off evil. Red is for good health. Yellow or Gold is for wealth. Pink is for romance. A happy orange maneki-neko with a collar and bib ringing a bell. Antique examples of maneki-neko may be made of carved wood, stone and metal, handmade porcelain or cast iron. 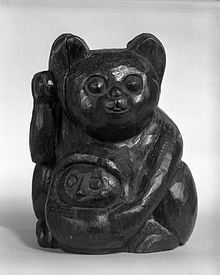 A wooden mold for a Maneki-Neko and Okiagari-Koboshi Daruma figure from the Edo Period, 18th century. Brooklyn Museum. It is commonly believed that Maneki-neko originated in Tokyo (then named Edo), while some insist it was Kyoto. Maneki-neko first appeared during the later part of the Edo period in Japan. The earliest records of Maneki-neko appear in the Bukō nenpyō's (a chronology of Edo) entry dated 1852. 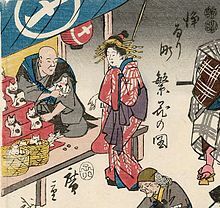 Utagawa Hiroshige's ukiyo-e "Joruri-machi Hanka no zu," painted also in 1852, depicts the Marushime-neko, a variation of Maneki-neko, being sold at Senso temple, Tokyo. In 1876, during the Meiji era, it was mentioned in a newspaper article, and there is evidence that kimono-clad maneki-neko were distributed at a shrine in Osaka during this time. A 1902 advertisement for maneki-neko indicates that by the turn of the century they were popular. Beyond this the exact origins of maneki-neko are uncertain, though several folktales offer explanations. Others have noted the similarities between the maneki-neko's gesture and that of a cat washing its face. There is a Japanese belief that a cat washing its face means a visitor will soon arrive. This belief may in turn be related to an even older Chinese proverb that states that if a cat washes its face, it will rain. Thus, it is possible a belief arose that a figure of a cat washing its face would bring in customers. In his Miscellaneous Morsels from Youyang, China's Tang Dynasty author Duan Chengshi (803?–863) wrote: "If a cat raises its paw over the ears and washes its face, then patrons will come". The stray cat and the shop: The operator of an impoverished shop (or inn, tavern, temple, etc.) takes in a starving, stray cat despite barely having enough to feed himself. In gratitude, the cat sits in the front of the store beckoning customers, thus bringing prosperity as a reward to the charitable proprietor. Ever after, the "beckoning cat" has been a symbol of good luck for small business owners. 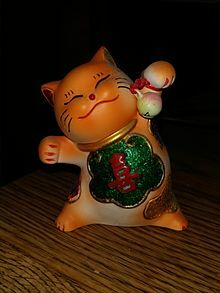 Chinese maneki-neko with a moving arm, which is electrically-powered by batteries. Modern Japanese folklore suggests that keeping a talisman of good fortune, such as the maneki-neko, in bedrooms and places of study will bring about favorable results and life successes. 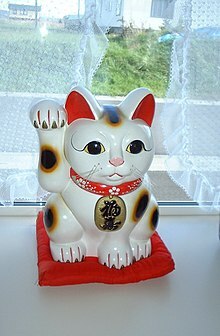 Because of its popularity in Chinese communities (including Chinatowns in the United States) the maneki-neko is frequently mistaken for being Chinese in origin rather than Japanese, and is incorrectly referred to as a "Chinese lucky cat"  or jīnmāo ("golden cat"). This cat is also prevalent in China domestically, and is usually referred to as the followings: simplified Chinese: 招财猫; traditional Chinese: 招財貓; pinyin: zhāocáimāo. The Pokémon named Meowth is based upon the maneki-neko. [dubious – discuss] Unlike traditional Maneki-neko who hold the Koban coin, Meowth has the coin projected from its forehead. Meowth can fire this coin as a projectile weapon with its signature move Payday. Netta performed her song "Toy" in front of two walls full of maneki-neko at the Eurovision Song Contest 2018. She won the competition after collecting 529 points at the final. ^ Henry H. Calero (2005). The Power of Nonverbal Communication: How You Act is More Important Than what You Say. Silver Lake Publishing. p. 116. ISBN 978-1-56343-788-5. ^ E. S. Wibbeke. "Gestures around the World". Globalbusinessleadership.com. Archived from the original on 11 March 2017. Retrieved 4 December 2012. ^ Shizuko Mishima. "Manekineko: Japanese Lucky Cats". Japan Travel. About.com. Archived from the original on 19 May 2012. Retrieved 3 August 2009. ^ a b c d e f g Alan Pate (2008). "Maneki Neko: Feline Fact & Fiction". Daruma Magazine. Amagasaki, Japan: Takeguchi Momoko. Archived from the original on 30 December 2012. Retrieved 30 December 2012. ^ a b "招き猫の色やあげている手の違いなど知られざる意味を一挙解説！". ねこちゃんホンポ. Retrieved 2019-04-18. ^ Mark Schumacher. "Maneki Neko: The Lucky Beckoning Cat". A to Z Photo Dictionary of Japanese Buddhist Statuary. Retrieved 3 August 2009. ^ "On the Origin of Species: Meowth - Bulbanews". ^ -, -. "Eurovision Song Contest 2018". Eurovision Song Contest. -. Retrieved 21 June 2018. 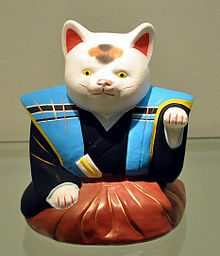 Wikimedia Commons has media related to Maneki neko. Masuda, Koh, Kenkyusha's New Japanese-English Dictionary (Kenkyusha Limited, Tokyo, 1991). Wellman, Laurel, Lucky Cat: He Brings You Good Luck (Chronicle Books, San Francisco, 2004). ISBN 0-8118-4121-9.